A fully analog Booster-Overdrive-Distortion (B.O.D. ), designed to deliver the great tones and feel found in the Timmy™, BluesBreaker™ and KOT™ pedals, with added touch sensitivity and overall more natural sound, due to our brand new cap-less technology®! Looking for that magic ingredient, we decided to think out of the box and removed all the capacitors from the audio path (coupling capacitors), which resulted in a more natural feel than ever before and respect to the original tone of the guitar without any added compression or color that would be coming from the coupling capacitors. By applying what we call cap-less technology®, you can really hear the character of your instrument and consequently your own hands! 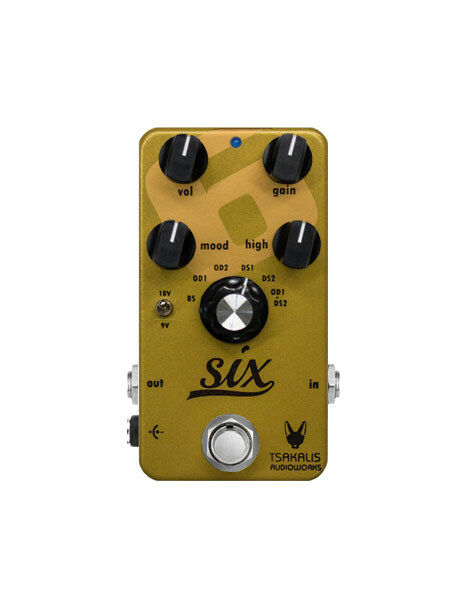 We are very proud to introduce the first cap-less® pedal called Six!